Imperial IPA is kind of a ridiculous term: it has no historical significance, and Double IPA is a better description of the same thing. Nevertheless, it's probably my favorite beer style if I had to choose one. Lots of hops, lots of malt, and lots of medicine. 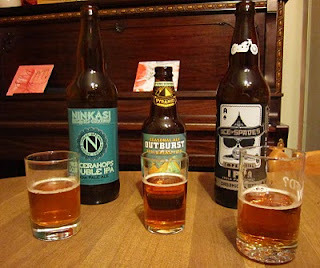 Hopworks just released the 2011 version of their IIPA, the Ace of Spades, and since they gifted me a couple bottles of it, I thought I'd try it out alongside a couple of other big IPAs of note: the stalwart Ninkasi Tricerahops, and this winter's price-performer: Pyramid Outburst. Tuesday night Dave came over from next door, and we did a blind tasting of the three, to see if we could tell which was which, and to see which one we liked the best. Carla also took a quick taste; she didn't try to identify them, but voted on what she liked. Sadly, I think the bottle of Tricerahops was a little old, even though I just bought it a couple days ago at New Seasons. It didn't have the giant, flowery hops that I expected, and there was quite a bit of murky sediment in the bottom of the bottle. It was so unimpressive that Dave and I both ranked it behind the other two, and we both assumed that our blind sample of Tricerahops was the cheaper Outburst. Remember when Tricerahops was this startling new style of gigantic, floral IPA? When you would call your friends if you saw it on tap somewhere? That was only 3 or 4 years ago. Now there are dozens of double IPAs, and a bottle of Tricerahops can be something of a letdown. In second place in our blind tasting -- actually, it was Carla's favorite -- was the Pyramid Outburst. A new offering this year, Outburst is priced right -- about $2 a bomber, or $6 a six-pack -- but I've had mixed emotions about it. The first time I tried it, I had already had a beer or two (can't remember which), and I was completely underwhelmed by Outburst. Then a few days later I popped one open after a long work day, and it really hit the spot. A couple more good experiences followed, until one day when I followed up a bomber of Firestone Walker Double Jack with an Outburst, and I almost wanted to cry. It tasted awful that day, like on Thanksgiving when you drink a glass of water after eating your cranberry sauce. Because of those experiences, I was a little worried about how it would fare alongside Ace of Spades and Tricerahops, but this time it held its own. Since it's such a bargain, stock up on Outburst while it's out there, just be careful how you use it. Which brings us to the Ace of Spades: boozy, malty, flowery -- what's not to like? Dave and I both picked it out of the lineup, and also found it to be the most satisfying of the three we tasted that night. Carla said it had an aftertaste she didn't like, but I almost wonder if that aftertaste was alcohol, given how big this beer is. Enjoy it while it's out -- last year it seemed to disappear almost before I realized it was available. It's highly recommended. That's a look at three Double IPAs. There are lots more out there: for example, we just went through our annual bout of Pliny the Younger madness, and Hop Henge is still pouring at Deschutes (and was $4 a bomber at the Burnside CVS a few days ago). And do try Double Jack if you run across it -- it's stunning. I love blind tastings and have thought about trying something similiar on my blog. All reviews SHOULD be done this way. Or they should use your beer review generator. I wish you'd included the Hop Henge in the tasting--it's my fave. (Oddly, the word verification I'm offered below is "hengst.") But the style is definitely NOT my fave, so I'm not the best judge of style. "Ace of Spades: ... what's not to like?" The price? Isn't the SPE on it pushing $25? Sanjay: I think comparisons are the way to go. 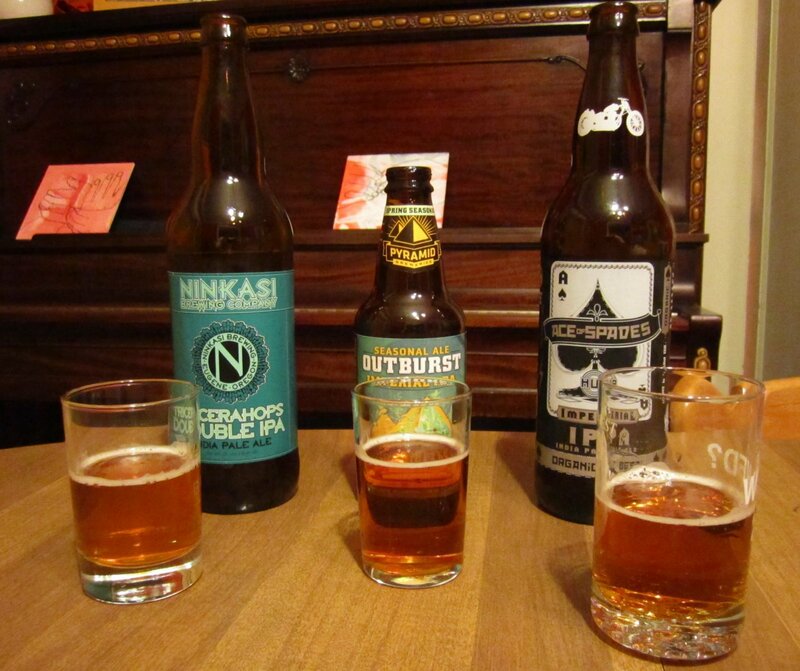 Check out this Seattle blog: Bottle Battle. Jeff: I could have thrown in a bottle of Hop Henge, but with only two dedicated tasters I didn't want to get in over my head. Maybe a face off between A of S, HH, and Double Jack will be a good sequel. Kevin: True, it's pretty pricey (I think I saw it for $7.25 at Beermongers -- SPE $24). I guess I can justify an occasional splurge on it as Hair of the Dog prices for something really good. That said, I was reminded as I pulled out a bottle that I smuggled back from my last NY trip, that East Coast Imperial IPAs seem to be running $10-12 a bomber!! I'm not sure if that's because the style is more of a novelty there, whereas here it's almost the state drink; or if it's just a reflection of generally higher prices for beer.